I am an evolutionary ecologist with a particular interest in small to medium sized carnviores, typically referred to as mesocarnivores (any member of the mammalian order Carnivora with a body mass of ~ 15 kg or less). Although my research interests are diverse, they typically are geared towards understanding the ecology, geographic distribution, and evolutionary history of this group of incredible animals. Given these diverse topics, I rely on a multitude of techniques, both field and laboratory based, to answer my research questions. Pertinent fields of study that I regularly draw from include disease ecology, spatial ecology, wildlife ecology, molecular and morphological systematics, phylogeography, ecological niche modeling, and biogeography. I am also interested in understanding the role of mesocarniovres in ecosystem functioning, including disease and parasite transmission as well as other ecosystem services such as seed dispersal. 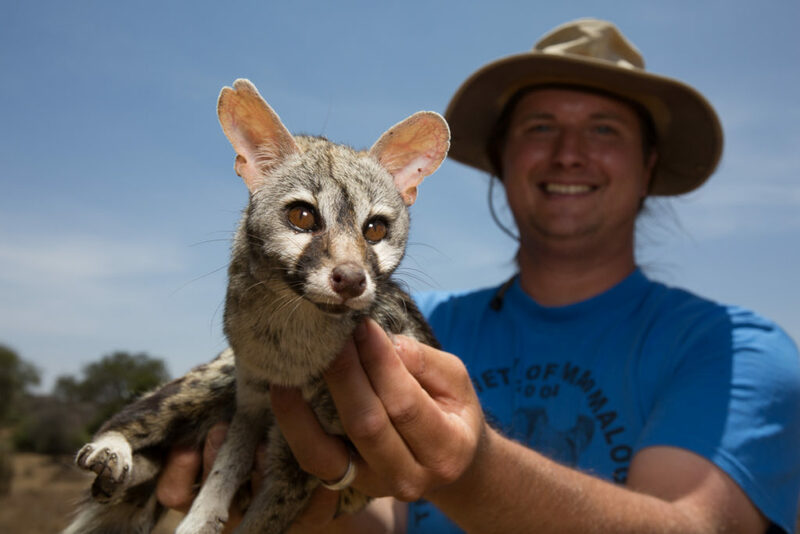 I am currently a NSF International Postdoctoral Fellow living and working in Laikipia Kenya where I am studying the impact of anthropogenic disturbance on behavior, immunity, and parasite dynamics of small carnivores such as the common genet (Genetta genetta) and white-tailed mongoose (Ichneumia albicauda). This project has aptly been dubbed SCRAPS- Small Carnivore Research and Parasite Study, as many of the species we study are considered the scraps of the African carnivore community in terms of research focus, and as such have to be quite ‘scrappy’ to carve out their own space in the spotlight (as well as their ecological niche). Of course I still have a serious passion for skunks, the enigmatic animals I did my PhD work on, and thus continue to collaborate with Dr. Robert C. Dowler of Angelo State University and others on interesting questions related to these small carnivores. Please feel free to browse the site and if you have any comments, suggestions, or criticisms, please do not hesitate to contact me via the contact page. Also, for those who are interested, there are pages addressing my current research, publications, C.V., and a BLOG designed to chronicle any interesting adventures (including my treatment for Leishmaniasis).